Property 9: Beautiful Southern Vermont Farmhouse on 100 Acres, Spectacular Views, Swim Pond! Property 14: Spacious Wilmington Home w/ Game Room & Deck! Property 15: 3 BR/2 Bath Post and Beam - Next to Haystack Golf Course. Property 19: 4 BR, 2BA: Comfy, Clean & Family Friendly - 15 mins to Mount Snow! Property 24: Spacious 5 Bdrm A-Frame: Walk to Lake Raponda. Wooded Setting. Ski Mount Snow! Country Home Ideal for Family Getaways. Property 32: Country Home Ideal for Family Getaways. Property 35: Large Home For Family Reunions, Retreats, Large Group Gatherings. Property 36: Walk to MoCA! N.A/Williams. 3 BR~Newly renovated in 2019! Property 39: Chic Berkshire Dollhouse! Property 41: The Old Academy, stay in a part of history. Property 42: COZY, WOODED RETREAT In The Taconic Hills 2+ BR 2.5 BA, large, open LR . Beautiful Vermont Vacation Home- Mount Snow!! 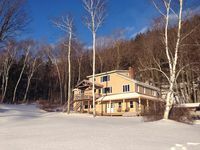 Property 45: Beautiful Vermont Vacation Home- Mount Snow! !